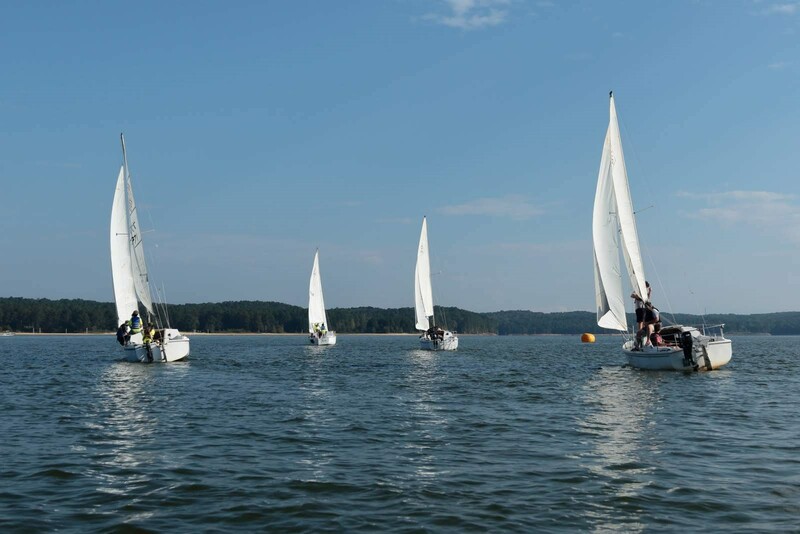 Ship 100 completed another successful Commodore Cup sailing regatta on Lake Allatoona. We entertained scouts from Nashville, LaGrange and West Ga, along with our Woodstock scouts, with 18 scouts overall. This year we sailed the larger 22’ sailboats instead of 14’ dinghy’s. Who knew racing in October would mean 90+ degree heat and light winds, but we completed 7 races over Saturday and Sunday. This year the races were for fun, while every 2nd year the races are qualifying races for the William I. Koch International Sea Scout Cup. The Koch Cup brings Sea Scout racers together from all over the world for a week of dinghy races. Each region sends a team or two to compete. This year we had a lot of race practice leading up the Commodore Cup, although one day was spent sailing in a downpour while a couple of days were called off due to storms or no wind at all. Scouts became familiar with dinghy sailing and big boat sailing along the way. 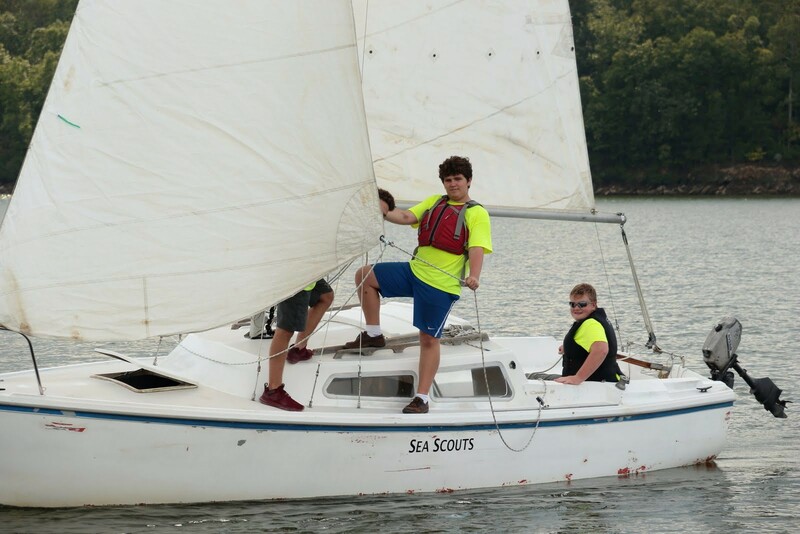 In addition, the scouts did prep work weeks ahead of the races, running pressure washers, repairing boats, rigging boats, and the occasional capsize drill on the dinghys. Each race consists of 1 lap starting from an invisible line between the committee boat and a start/finish marker. The racers sail upwind turning to port(left) around the windward buoy, then downwind to port around the leeward (downwind) buoy, then upwind back across the start/finish line. At the end of the weekend we have an award ceremony where we give out awards for 1st/2nd in council and 1st/2nd out of council. 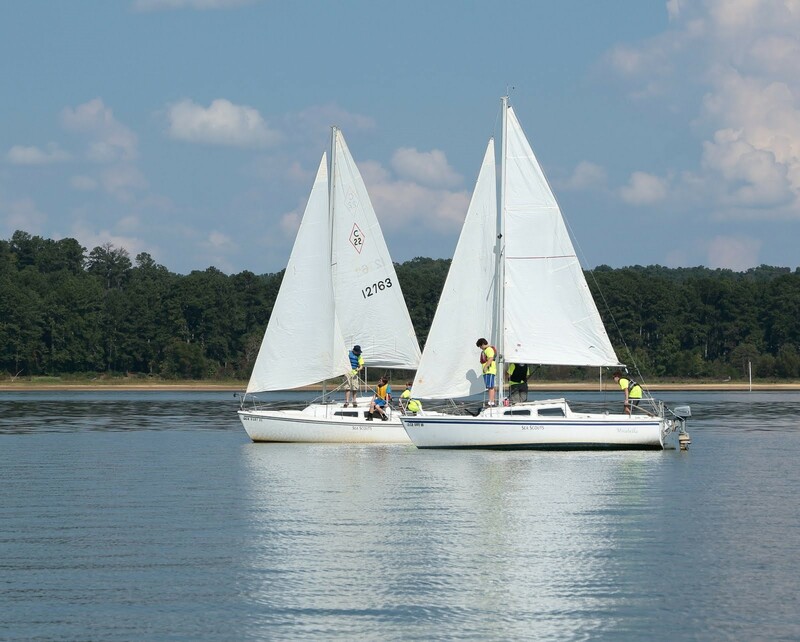 Race teams consisted of coed Sea Scouts with crews of 2-3 per boat on our fleet of Catalina 22’ sailboats.